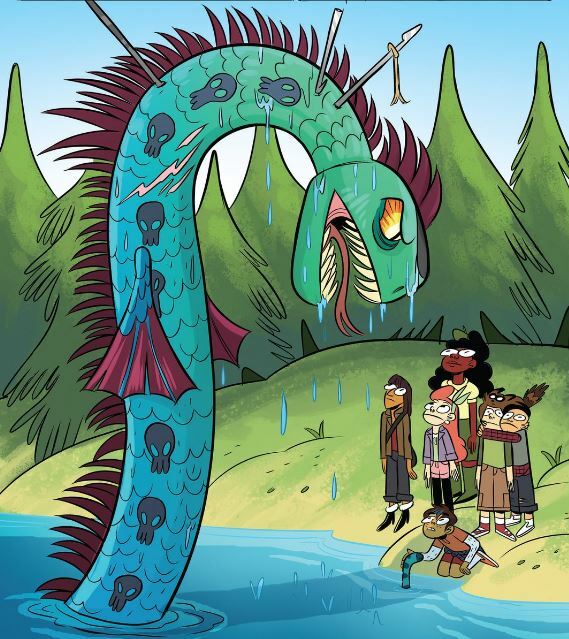 Lumberjanes Issue 17 and 18 recap! 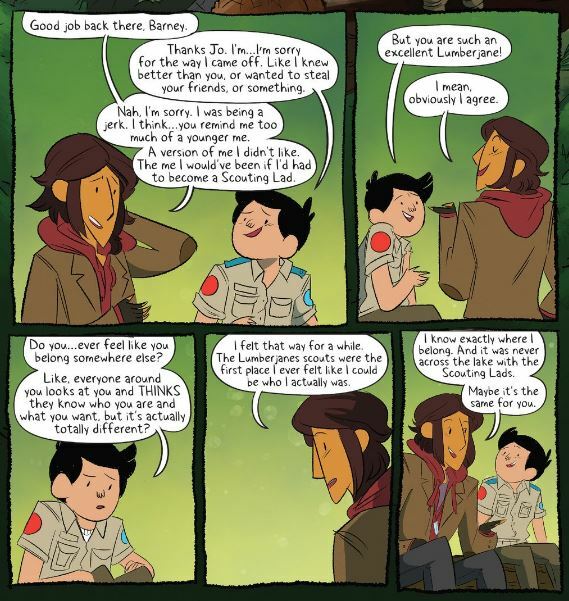 Get your s’mores fixin’s ready, it’s time for another Lumberjanes recap! Issue 17 opens up with a flashback. Young Rosie made an incredibly cute camper back in sepia toned days of yore! She and her friend Abigail, whom she called Abby, have sneaked out late to explore the many strange wonders of the woods. Turns out the LJ camp was just as strange and unusual back when Rosie was a kid, as it is for this newest generation of campers! This flashback is so cute, don’t you think? I loved those last three panels! So adorable, and so relatable it gave me flashbacks of my own. Flash forward to present day, and Abby is all grown up and shooting at the Grootslang like a maniac, while the ancient creature is doing its best to squash her like a bug. Rosie rushes to try to put an end to the madness, but there are falling boulders to contend with! P.S. : did you know the Grootslang is a real mythological creature? I’d never heard of it before, but the internet tells me its legend began in South Africa where it resided in a cave filled with diamonds and devoured elephants for breakfast! 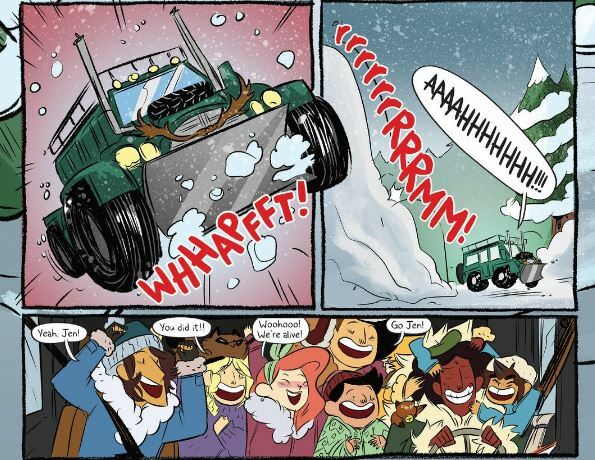 Meanwhile, the Lumberjanes and Jen are speeding away from an avalanche! Everyone is super proud of Jen and her awesome driving skills and ability to keep them alive. Jen has felt the power of the wheel and she loves it! They finally manage to make it to Abigail’s creepy cabin in the woods, but all is not well. April and Jo get into an argument over Barney. April tries to convince her that welcoming Barney into the group is the Lumberjane’s way, and no one should know that better than Jo! Jo walks away and they don’t resolve their argument. There are other pressing matters to deal with, anyway- like the giant angry monster on the hill! 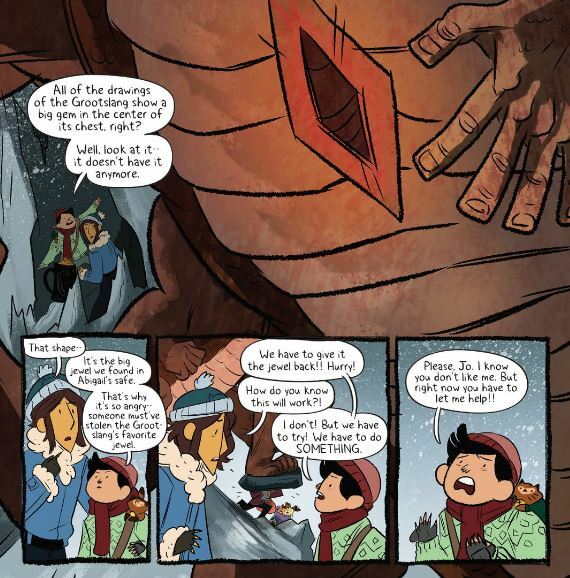 The Lumberjanes and Jen get to work, searching Abigail’s cabin for clues that could help them defeat the beast. Barney finds a book that mentions the Grootslang loves diamonds, and can be persuaded to be merciful to trespassers if it’s offered enough of them. 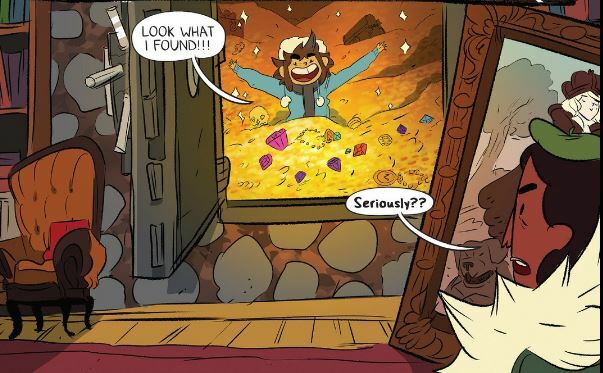 Ripley finds the mother load of all treasure rooms that would make even Scrooge McDuck happy! Poor Barney! I feel so bad for him! He’s just trying to help out his friends, and he’s getting nothing but flack for it. Still, they’re in a time crunch, so there’s not much they can do about it right then. April loads up with treasure chests, and the others stuff their pockets with all the gems and jewels they can carry, and they hurry to the mountain! 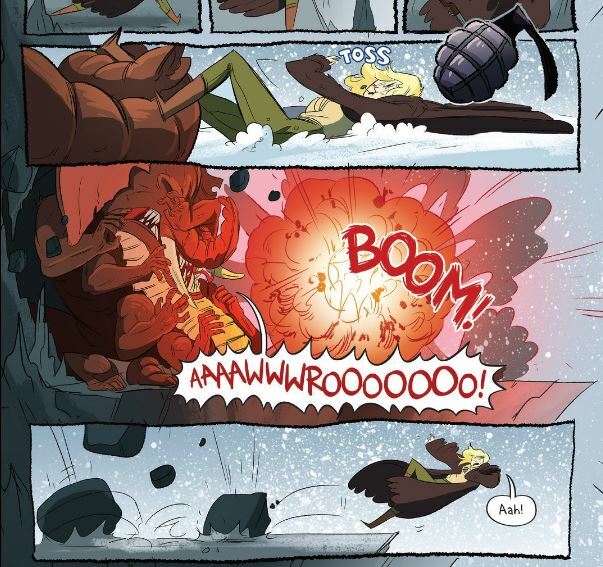 …The mountain where Abigail is tossing grenades at the gigantic, super angry Grootslang! Bad idea is it turns out, because the explosion causes more boulders to fall- one of which nearly crushes Abigail and causes her to fall off the side of the mountain! 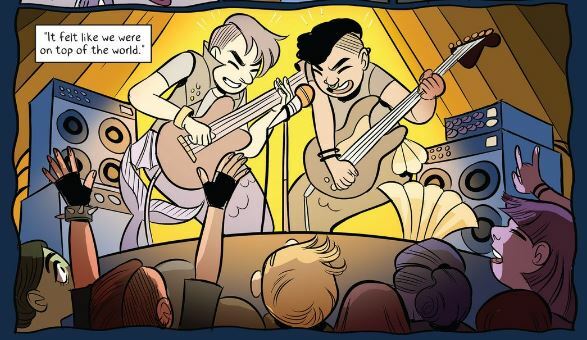 I do sincerely love the way the Lumberjanes always say things like this! They make all sorts of references to great women throughout history, some of whom I’ve heard of and others whom I’ve had to look up. Bonus points for being educational! 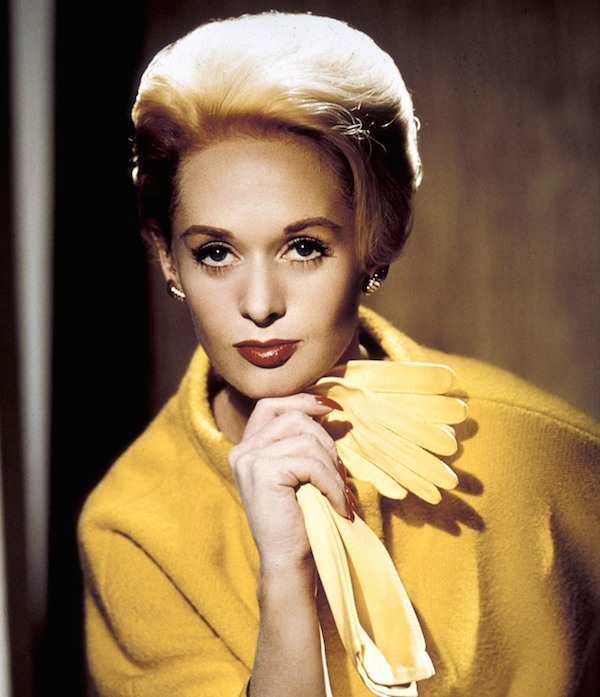 In that vein, and in case you didn’t know, Tippi Hedren is an actress probably best known (or, at least, best known by me) for her role in Alfred Hitchcock’s horror classic ‘The Birds’. 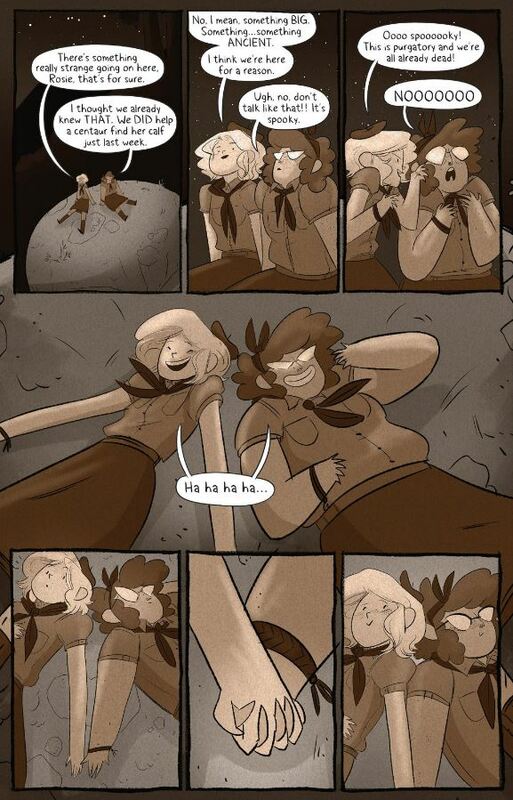 She’s also an animal rights activist, which seems totally appropriate for Rosie to reference when she’s trying to get her former friend to quit trying to kill an ancient and mythical creature! OMG! The Grootslang squashed her like a bug! Truth be told, I gasped when I read this panel. 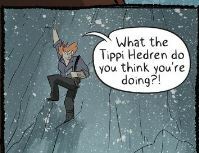 The creature then flicks her off the side of the mountain, and a horrified Rosie ties a rope around her waist and dives off the cliff after her just as the other Lumberjanes arrive with their piles of treasure! They nearly get squashed, too, but luckily April’s got super strength and is able to keep them safe for now. Jo runs to help, but Barney grabs her to wait because he knows exactly how to save the day and he begs Jo to let him help! 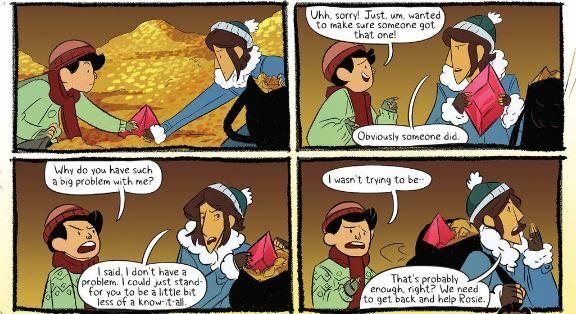 Jo and Barney bravely stand up and offer the big red jewel to the Grootslang in exchange for their friends, and luckily for them and the other Lumberjanes, the Grootslang reluctantly agrees. Turns out the jewel is its long lost heart stone that had been stolen years before and the big beasty is happy to have it back. The Grootslang warns them, though, that if another human comes a knocking, there will be hell to pay! Jo sits down with Barney and finally has it out with him. After the battle with the Grootslang, they’ve finally found some common ground, and they both apologize for the way they’d been behaving. They have a great little heart to heart about belonging, and Jo lets us in on the real reason she was irritated with Barney all along. I was super excited when I read these five panels that I actually totally spoiled the issue for a friend who hadn’t already read it. 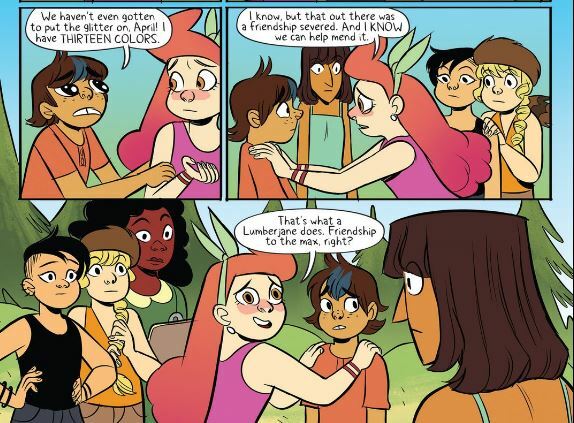 I thought it was just so awesome that Lumberjanes includes an openly trans character who’s totally accepted and loved by her friends for being exactly who she is. I mean, there just isn’t a lot of positive trans representation out there in general, less still of trans people of color, and even less that’s accessible to younger audiences. I vividly remember how I felt the first time I saw anything with openly lesbian characters (can we say life affirming?) 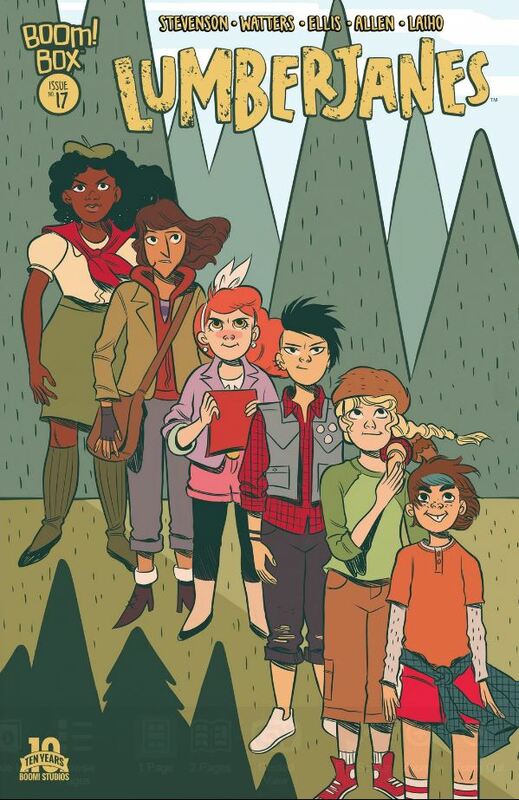 so I can only imagine Lumberjanes is doing the same for trans readers. It’s is awesome, plain and simple! Jo gets a call on her satellite phone from her dads, who think she’s only been gone a few days instead of a few weeks, and as the book ends April wonders what in the heck is going on in the magical, mystical woods they’re camping in. I don’t know either, but it sure is fun to watch them try to figure that out! The freak snow storm is over, but the strange happenings haven’t slowed down one bit! April insists she was just trying to help- though we don’t yet know what she’s referring to, and we launch into a flash back of very recent events where the LJ’s were having fun splashing round the lake. Jo was fishing when she got a bite! She finally manages to reel in her big catch, but it isn’t dinner she’s caught, it’s a sopping wet vest. 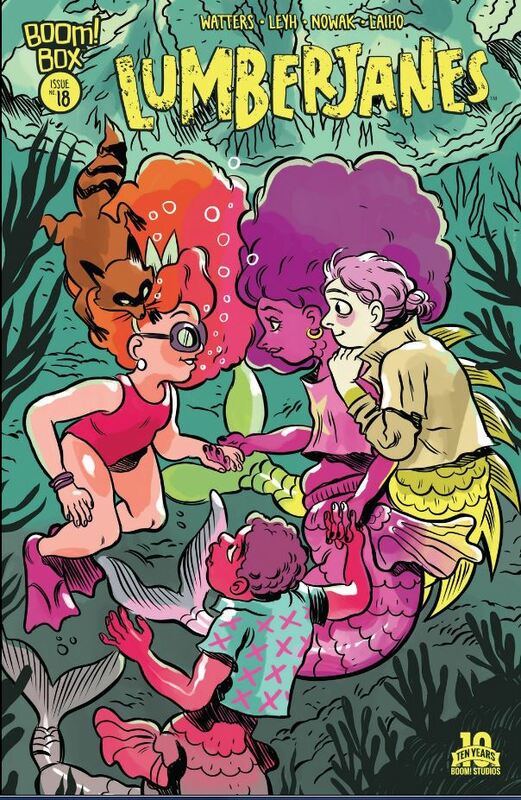 The owner pops out of the lake a moment later, demanding the two-legs gives back her property, and everyone kinda freaks- except April who’s kinda in heaven! Mal is totally smitten by the band patches all over the vest, and the merwomyn, Harlow, reveals she used to be in a band back in the good ol’ days. And then another merwomyn pops out of the water! 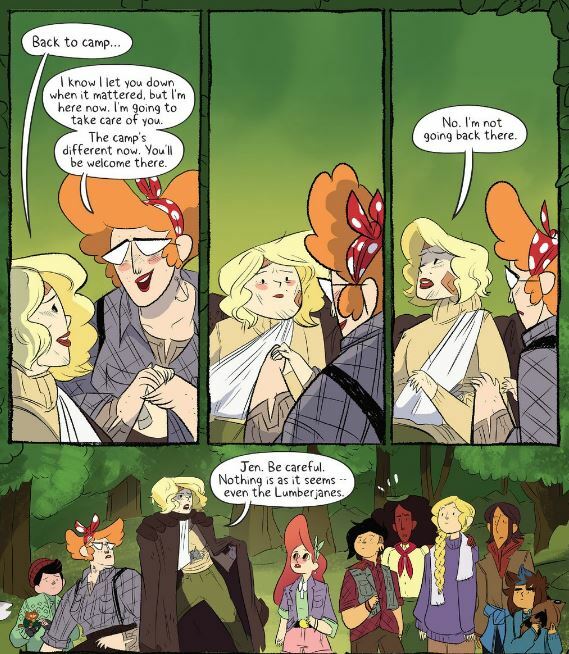 The Lumberjanes look just as surprised as Harlow does about this, and things get awkward in a hurry! And then these guys who up and it’s clear they’re trouble! I mean, the leader of the group clearly shops at the villain store. Carter reveals Harlow supposedly betrayed the band, and she grabs her vest and splits before things get too ugly on this side of the lake. 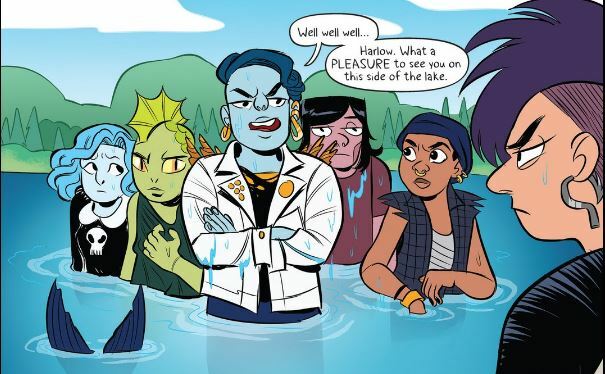 The ‘band’ is none to impressed when they finally notice the Lumberjanes have been watching this whole tense exchange, and they take off under the bright blue surface of the water to take care of whatever pressing mer-person business they have to attend to. 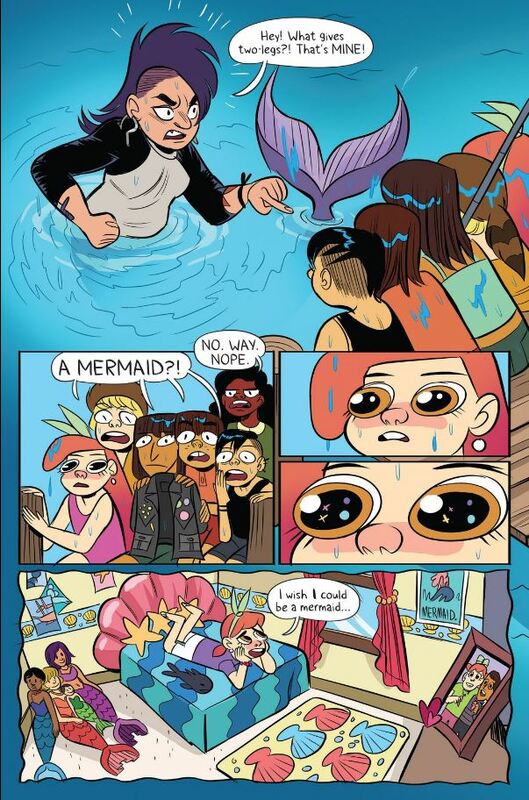 All of that was totally awesome and all, but Ripley and Jen want to go finish working on a dress involving ALL THE GLITTER so Ripley can earn her ‘Dressin’ for Successin’ badge, but April insists they gotta stick around and help sort out the mermaid drama, cuz friendship to the max and there’s a friendship that needs mending! They decide April’s right, and go hunting around to find Harlow, but instead find a cute little sea serpent thing (lake serpent?) and it’s giant, angry looking parent! Harlow shows up in the nick of time to shoo away the big fella’, and the LJ’s implore her to explain what the heck the deal is between her and her former band. Turns out, she and Taylor started the band when they were kids. Harlow and Taylor were hanging out together listening to music, playing gigs for screaming fans, going on long swims around the lake, but it all went to hell when they hired the drummer from hell: Carter! With Carter on drums, the band got big, they found more members who played different instruments- which all sounds great in theory, except it made Harlow unhappy. All she wanted was to play music with Taylor, and so she skipped the biggest gig the band ever played and they kicked her out! 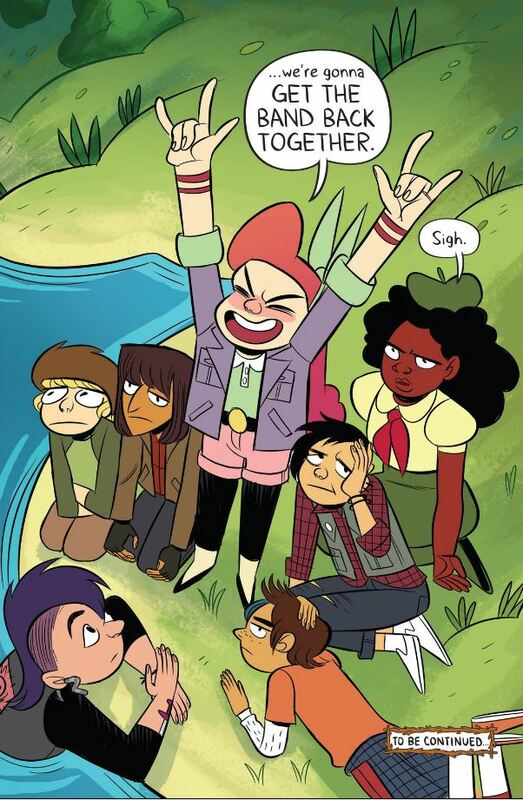 April declares the Lumberjanes on the case, and I’m dying to find out how she plans to pull this one off! Don’t you just hate these cliff hanger endings? !